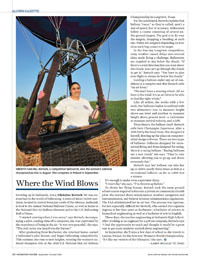 Growing up in Indianola, Iowa, Christine Bertsch ’00 was entrenched in the world of ballooning. A town of about 15,000 residents, located in central Iowa just south of Des Moines, Indianola is host to the annual National Balloon Classic, as well as home to the National Hot Air Balloon Museum and to the U.S. Ballooning Hall of Fame. After graduating from Rochester, she returned home, earned a balloonist’s pilot license, and began ballooning competitively. 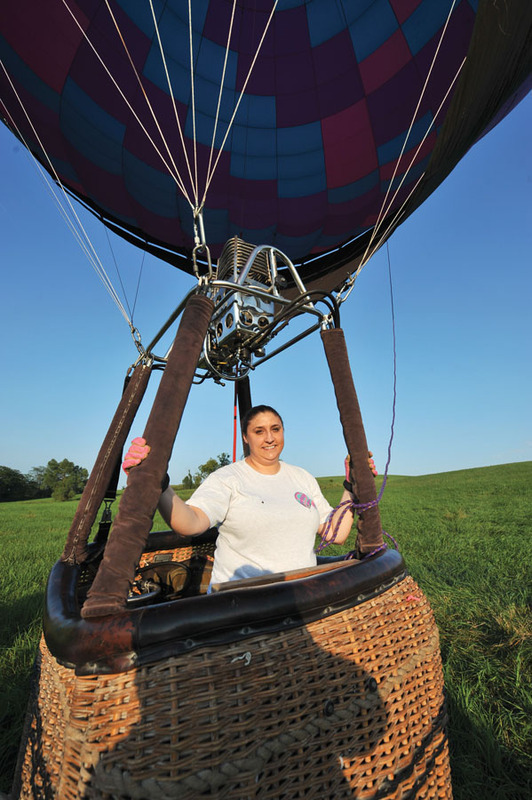 This summer, she rose to new heights, winning the women’s national champion title at the 2014 U.S. National Hot Air Balloon Championship in Longview, Texas. For the uninitiated, Bertsch explains that balloon “races,” as they’re called, aren’t a test of speed, but of accuracy. Balloonists follow a course consisting of several on-the-ground targets. The goal is to fly over the targets, dropping a beanbag at each one. Points are assigned depending on how close each bag comes to its target. Like all artists, she works with a few tools. Her balloon’s basket is outfitted with two altimeters—one to measure height above sea level and another to measure height above ground level—a variometer to measure vertical velocity, and a GPS. Then there’s the balloon itself. Bertsch calls hers Champagne Supernova, after a 1996 hit by the band Oasis. Bertsch says her balloon can take her up or down nearly three times as fast as a recreational balloon—as far as 1,800 feet a minute. It’s enough to make even a spectator dizzy. To obtain her flying license, Bertsch took the same ground school course required to become a private or commercial aircraft pilot. She learned about aerodynamics, weather, navigation and instrumentation, and Federal Aviation Administration regulations. The FAA administered her in-air test. The process was rigorous, but not especially difficult for Bertsch, who earned two separate degrees in her four years at Rochester—a bachelor of science in biomedical engineering as well as a bachelor of arts in English.